English: Ah, Sir, your broth is really light... even the patients complain that it does not sustain them! - I have corrected that... but today it might be a bit too strong... I added to the pot half a game of Dominos more than yesterday... including the double six to give it a nice color. 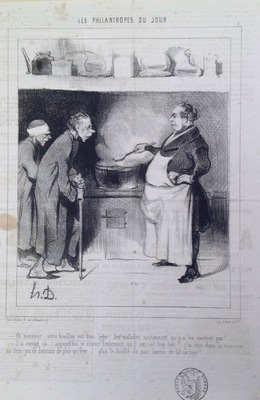 In this print from the series “Le Philantropes du Jour” (The Philanthropists of Today), Daumier mocks “good Samaritans” who provide half-hearted assistance to the poor. The well-fed chef at this soup kitchen has created a recipe that seems high in creativity, but exceedingly low in nourishment.